Airglow is aurora-like phenomenon caused by chemical reactions in the upper atmosphere. Human eyes seldom notice the faint glow, because it is usually very faint, but it can be photographed on almost any clear dark night, anywhere in the world. Beletsky is a veteran photographer of airglow, having captured it dozens of times from sites in Chile and the South Pacific. “The intensity of airglow varies, and sometimes it can be more prominent, as it was on Oct. 2nd,” he says. 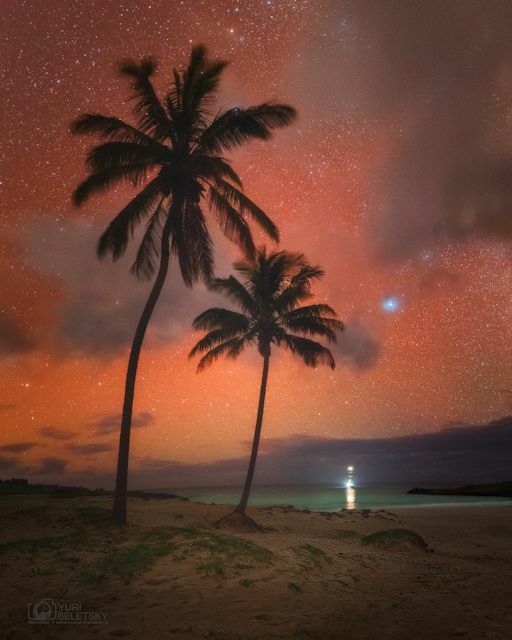 The curious thing about Beletsky’s photo is not the intensity of the airglow, but rather its color–red. Airglow is usually green, the color of light from oxygen atoms some 90 km to 100 km above Earth’s surface. Where does the red come from? Instead of oxygen, OH can produce the ruddy hue. 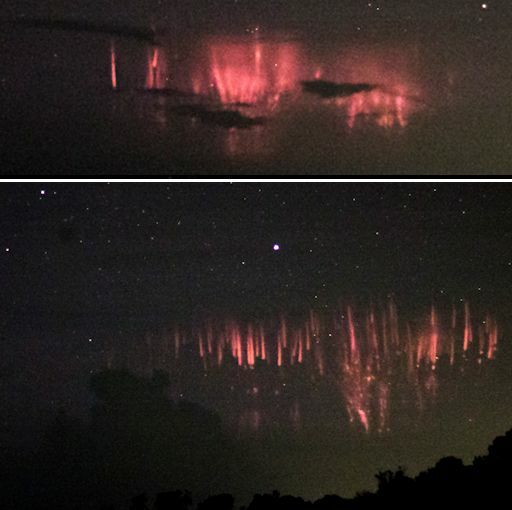 These neutral molecules (not to be confused with the OH- ion found in aqueous solutions) exist in a thin layer 85 km high where gravity waves often impress the red glow with a dramatic rippling structure. Specifically, they looked at pulses of noise in an ultraviolet photometer carried aboard many polar orbiting Defense Meteorological Satellite Program (DMSP) satellites. When high-energy protons in the SAA pass through these sensors, they produce spurious signals–or, in the case of this study, valuable data. By monitoring the rate of spurious UV pulses, the researchers were able to trace the outlines of the anomaly and monitor its evolution over a period of years. One maximum coincides with an equinox, but the other does not. The authors were not able to explain the origin of this unexpected pattern. The solar cycle matters, too, as the data revealed a yin-yang anti-correlation with sunspots. “During years of high solar activity, the radiation intensity is lower, while during solar quiet years the radiation intensity is higher,” writes Schaefer. According to orthodox thinking, the SAA reaches down from space to within about 200 km of Earth’s surface. Below that altitude, its effects should be mitigated by the shielding of Earth’s atmosphere and geomagnetic field. 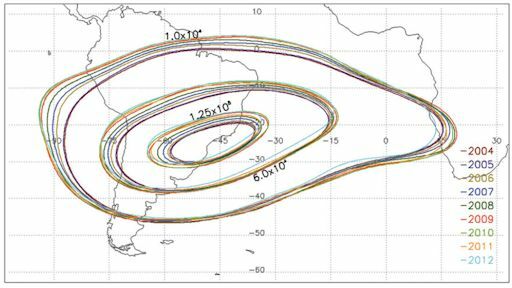 To test this idea, Spaceweather.com and Earth to Sky Calculus have undertaken a program to map the SAA from below using weather balloons equipped with radiation sensors. Next week we will share the results of our first flight from a launch site in Chile. Stay tuned!